Each May, we host an awards luncheon, Tribute to Women, to honor a select group of women living or working within our service area who have made remarkable contributions in their professions and communities. 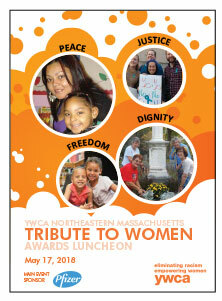 Additionally, the luncheon raises crucial funds for more than 26 YWCA programs and services in Lawrence, Haverhill, Lynn and Southern NH. By supporting this event, your gift will have an immediate, significant and on-going impact on the lives of the 15,000+ people we annually serve. Our Advertising Levels are open until the deadline of Friday, April 19, 2019. Ads received after this date will be unable to appear in our Program Book. Please select one of the advertising sponsorship levels below, and you’ll be taken to the Payment Page, where you can pay securely via credit card. A business card must be mailed to: YWCA, Attn: Susan McNeff, 38 Lawrence Street, Lawrence, MA 01840. Please note that it must be received before Wednesday, April 26, 2017. Cards received after this date will be unable to appear in the program book. We do not edit ads. All ads [full page – which comes with certain sponsorships only, half page, quarter page and business card] must be submitted online in PDF format only. Upon confirmation of payment, we will email you the link to use to upload your ad. If you are unable to pay online, you may download the Sponsorship & Reservation Form, which you may download, print, complete and mail with your payment. Please note that even by paying offline, your ad still must be uploaded online, and we will email you the link once we confirm payment. Offline payment deadline is also Friday, April 19, 2019. Ads received after this date will be unable to appear in our Program Book.